“Paint easier. Paint smarter. Paint without the wait!” The makers of Painter’s Pyramid claim their product will save you time and effort, and we found much truth in this claim. The simple plastic devices allow you to paint one side of a workpiece immediately after the other without having to wait for the fresh paint to dry. They’re non-stick and non-marring, and they can even handle large workpieces weighing up to 200 pounds! To save time and effort, you paint one surface of your project as you normally would, place the workpiece face down on four or more Painter’s Pyramids, and then move on to the sides and opposite surface. The pyramids resist paints and solvents, to ensure that your freshly painted surfaces remain intact. 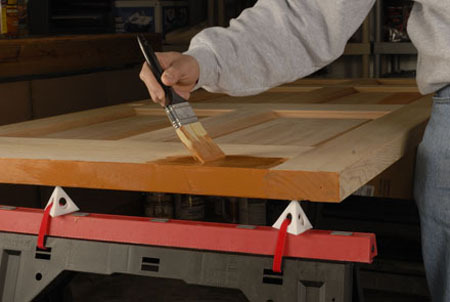 The 2-1/2″ pyramids rest evenly and stably on most surfaces, and you can secure them to unconventional work surfaces such as sawhorses using the holes in the sides of the Painter’s Pyramid. The rounded tips help prevent gouging and denting. 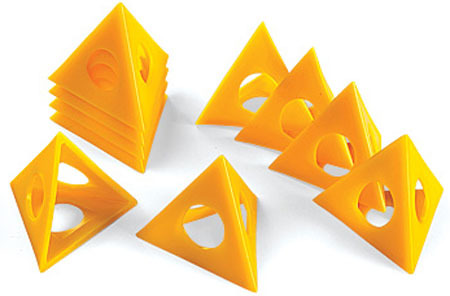 Many woodworking retailers sell Painter’s Pyramids in packs of ten. You can also purchase standard packs or mini-packs of four in the color of your choice directly from the manufacturer. The manufacturer is also running a “buy three sets, get one free” promotion, if you’re looking to purchase in bulk. Standard packs cost $6 to $7, with mini-packs selling for $3.50. Anyone use these and can confirm that they don’t leave 4 little marks in your workpiece? I’ll probably use my old standby: board with nails in it. It’s also good for personal and home security. Jim, it depends on what material you’re talking about. Oak or maple? No problem. Aluminum, no problem, unless it’s a really heavy panel. Soft woods like pine, WILL mar under pressure. Then again, everything will mar pine. Using my hand to press a piece of maple into one of the pyramids does not leave a mark. Putting the pyramid on the table and really pushing the wood into the pyramid does leave a mark. Even then, the dimple is maybe a few mil (not even one mm) deep, and maybe one mm in diamater. If the curvature of radius was any broader, then the tip would be too wide, possibly causing it to interact or adhere to the fresh paint. At first look these seemed really gimmicky to me. But, I figured they might come in handy, so I purchased a pack from Lee Valley as part of a larger order. Worst case scenario, I’d use them to construct a mini shelf or something. But, they surprised me. They pyramids are much better constructed than I had anticipated, and they satisfy the manufacturer’s claims well enough that I feet comfortable recommending them. I bought a couple sets a few months ago when I had a bunch of small pieces to paint. I highly recommend them. The tips are not pointy, but rounded slightly, so they’re less likely to leave marks than nails. Thank you for the kind words on my invention, the Painter’s Pyramid. Many have questioned the product because it seems like such a simple solution… If it is so good, why wasn’t it already available? I am thankful that it was not already invented. While I would have saved a bunch of time painting a bookshelf, I would also still be sitting behind a desk at a financial services company. Instead, I am trying to live the American Dream by starting my own company and bringing my invention to market. I appreciate the comment that alternatives exist to the Painter’s Pyramid. The most common is driving nails into a board. This solution can generally work fine. The Painter’s Pyramid offers many benefits over this solution including they are safer to use, nest for easy storage, versatile enough to attach to a sawhorse and will not damage/scratch the part that you are working on. Not to mention they save the time and materials in constructing and disassembling the “bed of nails”. Not bad for under $10. I’ve needed these all my life. I just painted something on my nail boards, but these look much nicer and will take up less space. Ordered a 3+1 pack. Good job on taking Paypal. Most brilliant inventions are simple and the Painter’s Pyramid is no exception. Over the years, I’ve attempted duplication of this very concept using cardboard, which failed after extended use or while in storage. I’m not a woodworker, painter or handyman but rather a crafter. Depending on the project, I need my work to be either elevated for punch needle embroidery or on a stable slope for lace making, watercolor painting, and watercolor pencil art. I’m sure if I thought about it, there are many other arts & craft projects for which the Painter’s Pyramid would be useful. I use the Painter’s Pyramids a lot. I coat lots of paintings in resin and often need something to hold the panel up off the table. These always give me the level surface that I need. The resin is self-leveling and with most other items I have used to get my panel level, I could not count on them giving me a level surface.